For many reasons I have been interested for the last few years in how agricultural practices affect microbiomes. For example in regard to crops, how do farming practices affect the microbiomes of the plants, the microbiomes of the soil and area around the plants, and the microbiomes of organisms (including humans) who make use of the plants? I won’t go into all the detail right now for why I am interested in this topic but for some examples of my work in this area see The microbes we eat abundance and taxonomy of microbes consumed in a day’s worth of meals for three diet types and Structure, variation, and assembly of the root-associated microbiomes of rice. Anyway, the reason I am writing this now is that tomorrow I am “testifying” to a NRC Committee about this topic and some related topics. The presentation will be shown live online (register here). And I thought, in the interest of openness, I would post some of what I am thinking about here before hand. One of the key topics for tomorrow is something I have been snooping around at for a few years – how does glyphosate (the key ingredient of RoundUp and a widely used herbicide) affect microbiomes? I am interested in this from both a scientific point of view (I think it is an interesting topic) and also from a “public policy / education” point of view. 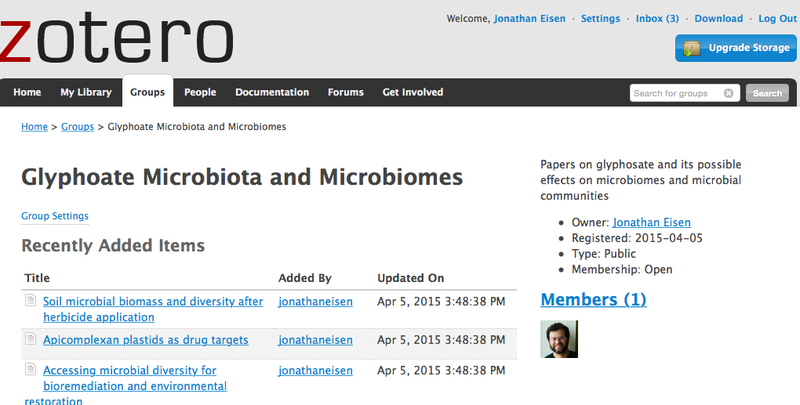 I think this is a really good topic to have a public discussion of “microbiomes” and both the importance of microbial communities and the challenges with studying them. So a few years ago I started thinking about working on this and developing a “Citizen Science” project around it. And, well, I am still working on that idea and probably will be trying to launch something in the near future. As a first start I thought it would be good to start to engage the community (researchers, teachers, the public, etc) in a discussion of this topic. So .. this is the beginning of that I guess. Does glyphosate affect plant microbiomes? Does glyphosate affect soil microbiomes? Does consumption of plants treated with glyphosate affect the microbiomes of the consumer? If glyphosate affects any of these microbiomes above, are these significant affects (e.g., in terms of health)? Now I am not the only person who is interested in this topic. In fact, there have been many people looking into these and related topics for years. Some of the things I have seen on this topic in the popular press and the scientific literature are, well, not good science. And some of the things I have seen are fascinating and well done. So as a first step in looking into this, I scoured the literature for papers of interest. And that is really why I am writing this. I created an open collection of the papers I have found with the Zotero reference collection system. See this link for the collection. And if you know of any other papers truly related to this topic, please add them to the collection (learn more about Zotero here). I do not profess to know everything about this topic. But I think it is interesting and possibly important.